The Georgia Planners4Health initiative brought together professionals from the fields of planning and public health throughout the state, including public sector, private sector, advocates, and academia. Task force members participated in a collaborative process, with regular work sessions and a roundtable event to develop better ways for planners and public health professionals to partner. 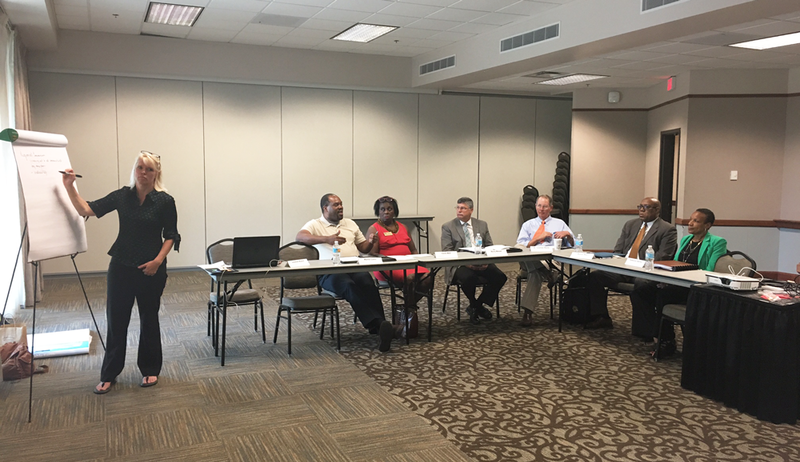 We focused on statewide strategies through greater collaboration between the APA's Georgia Chapter and the Georgia Public Health Association (GPHA), as well as regional and local actions that our health districts, planning agencies, and business members could take. The statewide roundtable conversation resulted in a greater understanding of each profession’s goals, agency structures, applicable regulations and standards, affiliations, skills, and resources. Participants discussed best practices and how to share lessons learned across the state. Georgia Planners4Health roundtable. Photo courtesy Georgia Planners4Health Task Force. Planners4Health outcomes included an assessment of the awareness and understanding of each other’s professions, state of the practice in cross-sector partnerships, and opportunities for joint outreach and education. The results are valuable for informing future collaboration and for expanding partnerships to new regions and municipalities. What can the Georgia Chapter of APA (GPA) do to promote healthy communities? The Task Force made several organizational recommendations to GPA. GPHA and GPA leadership have committed to working in partnership to promote healthy communities into the future. Invite cross-sector participation in public outreach and education around specific events, plans, policies, and projects. Share data, contact lists, and resources as applicable. Promote best practices via joint presentations at Georgia Municipal Association, Association of County Commissioners of Georgia, the legislature, National League of Cities, Chambers of Commerce, and the Carl Vinson Institute of Government events. Promote Policy, System and Environmental change (PSE) via letters of support, joint policy statements, and legislative education efforts. Establish a GPA “Quality Community” day or outreach day at the capitol. Align with GPHA and other partner organizations such as Georgia Transit Association. Planning promotes quality of life, and quality of life generates economic development. Everyone should have the opportunity to make the choices that allow them to live a long, healthy life regardless of where they live. Zoning Ordinance language to promote health via smart growth; transit oriented development; walkability; adequate greenspace and active recreation opportunities; and access to healthy food via mobile markets, farmers’ markets, and corner stores. Logos of organizations engaged in Healthy Savannah, a Cohort One Plan4Health coalition. Image courtesy of Whitney Shephard, Plan4Health project manager. What can you do to engage public health professionals in your community? Seek out your County and Health District leadership; identify local public health staff with an interest in built environment, including healthy eating and physical activity. Make direct invitations to public health professionals to participate in plans and policies; create a public health position on advisory committees, stakeholder committees, and in plan review processes. Include a health component in local and regional Comprehensive Plans. The success of the Planners4Health project will playout in evolving partnerships at the state, region, and local levels. The Task Force has effectively engaged planners, public health professionals and other team members. Our goal over the next year is to raise cross-sector awareness and understanding via conference presentations, newsletter articles, and joint leadership workshops. The critical message is this: Planning promotes health. Health makes the case for good plans. Participants in the Task Force and Roundtable were overwhelmingly positive. Top image: Healthy Savannah Coalition Members and Plan4Health staff tour a local community garden. Photo by Elizabeth Hartig. Whitney Shephard is cofounder of Transport Studio, a planning and engineering firm. She manages diverse projects for nonprofits and local and regional governments. Recent projects have increasingly focused on healthy communities, promoting access to nutritious food and physical activity through policy and infrastructure investments. With her husband, she co-owns Green Truck Neighborhood Pub, a Savannah restaurant that features local and organic farmers and craft American brewers. Together they support a variety of community organizations.